Arlette Revells is a dear friend of Melvine and me. For many years she has helped me with my ministries through her professional graphic designs. She founded Great Works Creation Company over 25 years ago and has enjoyed continuous growth each year. Great Works is a one-stop studio for marketing services through graphic design, printing, and mailing services. She works with clients in many different states. She has received 1st place recognition for her graphic designs. Since 1988 she has served with Joysprings Foundation, Inc., a ministry to pastors, missionaries, writers, musicians, and marketplace entrepreneurs. ​She enjoys speaking at women’s conferences, retreats, business luncheons, leadership seminars, mother/daughter events, and more. 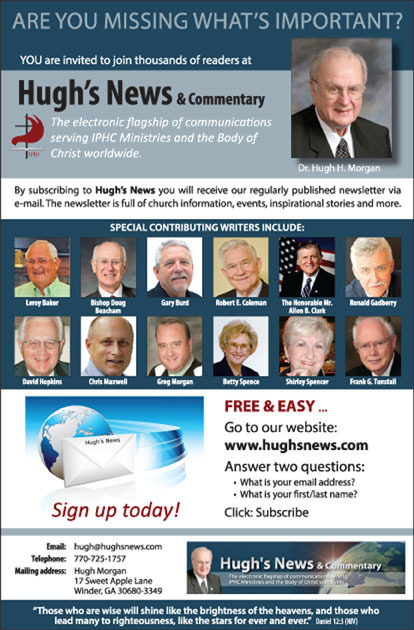 I am pleased to announce that Arlette Revells has designed this new promotional design for Hugh's News. It will appear in the 2016 Youth Quest Notebook. ​Youth Quest will be held in Daytona Beach, Florida in July. Hugh's News, Inc. is a supporter of Youth Quest. If you'd like to download and print your own high resolution copy of this poster, just click the link to the right.